Like no one else, the Swedish researcher Hans Rosling knew how to use a bubble. Where are we going? To making statistics memorable. 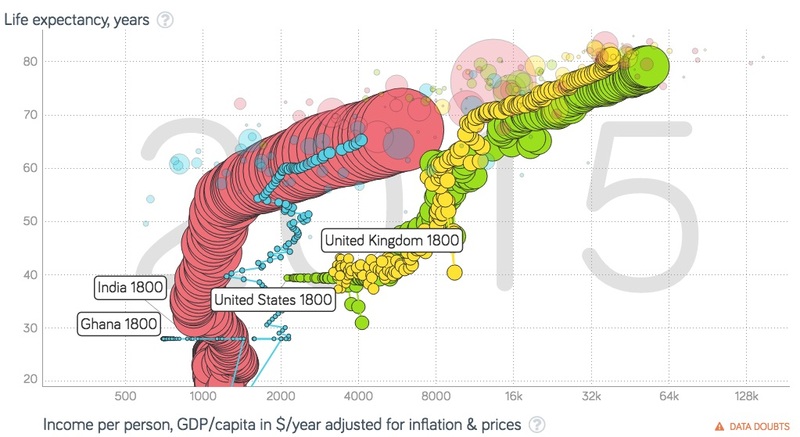 Assume you want to compare life expectancy and GDP per person from 1800 to 2015 for two countries. Not only would your data be massive but the analysis could be daunting. Dr. Rosling made it simple with his bubble animations. Below, I selected India (pink), Ghana (blue), the U.S. (green) and the U.K. (yellow). Displaying the end of the animation at Gapminder.org, the image shows the chronology of each country’s progress. Not only does it let you compare them but also you can form hypotheses about how life expectancy and GDP correlate. 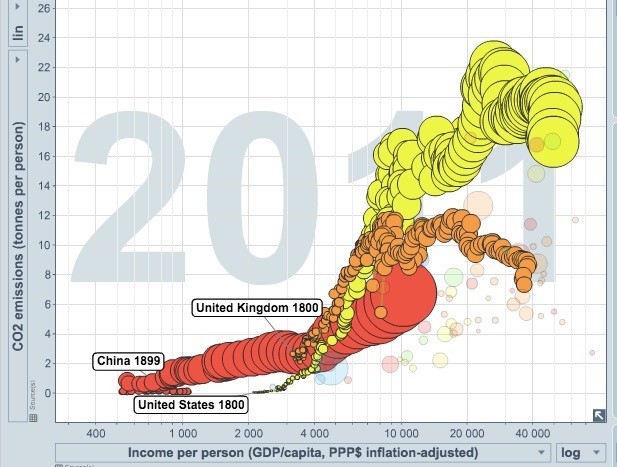 From these kinds of bubble animations, Hans Rosling hoped we would distinguish among nations. He wanted us to know that Africa was not a monolith. Each country has its own position on an economic and health continuum. His message? Only with accurate facts can we help people live healthier and wealthier lives. Just 68 years old, Hans Rosling died on February 7th in Uppsala, Sweden. 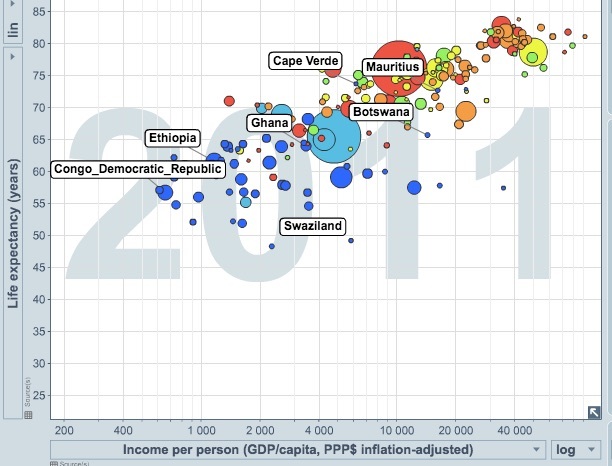 My sources and more: Gapminder has it all if you just want to see Dr. Rosling’s work. One warning. Once you start, it’s tough to stop. I do also recommend taking a look at this NY Times obituary and listening to this podcast if you have less time. Best of all though are his TED talks.